在不同的API之间使用一致的编程模型, 如Java Transaction API (JTA), JDBC, Hibernate, Java Persistence API (JPA), 以及 Java Data Objects (JDO). Spring Framework的事务支持模型的优点 描述了你 为什么 需要在 EJB 的容器管理事务(Container-Managed Transactions,CMT)中或者使用本地的单独API, 如Hibernate, 时使用 Spring Framework的事务抽象来代替Hibernate. 理解Spring Framework事务抽象 给出了核心类, 并且说明了怎样从各种数据源中 配置和获取DataSource实例. 事务中的资源同步 描述了应用代码怎么确保资源是created, reused, 和 cleaned up完成了. 传统上, Java EE 开发者在事务管理上有两个选择:全局 或者 本地 事务, 每一个都有严重的局限性. 关于全局和 本地事务管理的介绍将在接下来的两节给出, 就在讨论Spring Framework的事务管理支持是怎样弥补这些限制之后. 全局性事务可以让你混合使用事务资源,传统关系型数据库以及消息队列. 应用服务器管理事务是通过JTA,他的API用起来很笨重(来源于 他的异常处理模型). 另外, 一个 JTA 的UserTransaction 通常需要由JNDI提供, 意味着你在使用JTA的同时 也 需要使用JNDI. 很明显,当JTA是应用服务器上唯一可用的全局事务时,使用它会限制你对应用代码的重用. 原先, 较为提倡的使用全局事务的方式是使用EJB 的CMT (容器管理事务,Container Managed Transaction): CMT is a form of declarative transaction management (as distinguished from programmatic transaction management). EJB CMT removes the need for transaction-related JNDI lookups, although of course the use of EJB itself necessitates the use of JNDI. It removes most but not all of the need to write Java code to control transactions. The significant downside is that CMT is tied to JTA and an application server environment. Also, it is only available if one chooses to implement business logic in EJBs, or at least behind a transactional EJB facade. The negatives of EJB in general are so great that this is not an attractive proposition, especially in the face of compelling alternatives for declarative transaction management. The above definition of the dataSource bean uses the <jndi-lookup/> tag from the jee namespace. For more information on schema-based configuration, see Chapter 33, XML Schema-based configuration, and for more information on the <jee/> tags see the section entitled Section 33.2.3, “the jee schema”. Spring AOP is covered in Chapter 9, Aspect Oriented Programming with Spring. Examine the preceding configuration. You want to make a service object, the fooService bean, transactional. 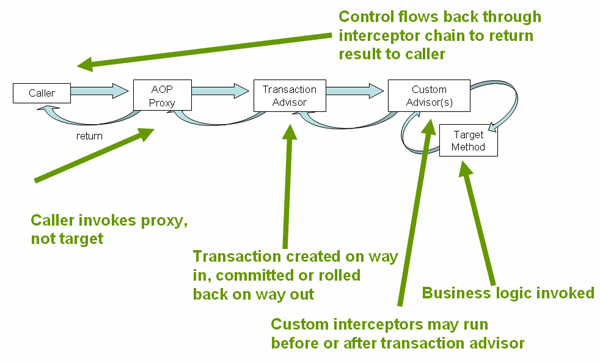 The transaction semantics to apply are encapsulated in the <tx:advice/> definition. The <tx:advice/> definition reads as "… all methods on starting with 'get' are to execute in the context of a read-only transaction, and all other methods are to execute with the default transaction semantics". The transaction-manager attribute of the <tx:advice/> tag is set to the name of the PlatformTransactionManager bean that is going to drive the transactions, in this case, the txManager bean. You can omit the transaction-manager attribute in the transactional advice ( <tx:advice/>) if the bean name of the PlatformTransactionManager that you want to wire in has the name transactionManager. If the PlatformTransactionManager bean that you want to wire in has any other name, then you must use the transaction-manager attribute explicitly, as in the preceding example. The expression defined within the <aop:pointcut/> element is an AspectJ pointcut expression; see Chapter 9, Aspect Oriented Programming with Spring for more details on pointcut expressions in Spring. In this example it is assumed that all your service interfaces are defined in the x.y.service package; see Chapter 9, Aspect Oriented Programming with Spring for more details. Now that we’ve analyzed the configuration, you may be asking yourself, "Okay… but what does all this configuration actually do?". You can also specify no rollback rules, if you do not want a transaction rolled back when an exception is thrown. The following example tells the Spring Framework’s transaction infrastructure to commit the attendant transaction even in the face of an unhandled InstrumentNotFoundException. When the Spring Framework’s transaction infrastructure catches an exception and is consults configured rollback rules to determine whether to mark the transaction for rollback, the strongest matching rule wins. So in the case of the following configuration, any exception other than an InstrumentNotFoundException results in a rollback of the attendant transaction. Transaction timeout value (in seconds). @EnableTransactionManagement and <tx:annotation-driven/> only looks for @Transactional on beans in the same application context they are defined in. This means that, if you put annotation driven configuration in a WebApplicationContext for a DispatcherServlet, it only checks for @Transactional beans in your controllers, and not your services. See Section 16.2, “The DispatcherServlet” for more information. Currently you cannot have explicit control over the name of a transaction, where name means the transaction name that will be shown in a transaction monitor, if applicable (for example, WebLogic’s transaction monitor), and in logging output. For declarative transactions, the transaction name is always the fully-qualified class name + "." + method name of the transactionally-advised class. For example, if the handlePayment(..) method of the BusinessService class started a transaction, the name of the transaction would be: com.foo.BusinessService.handlePayment. PROPAGATION_REQUIRES_NEW, in contrast to PROPAGATION_REQUIRED, uses a completely independent transaction for each affected transaction scope. In that case, the underlying physical transactions are different and hence can commit or roll back independently, with an outer transaction not affected by an inner transaction’s rollback status. This chapter is not concerned with explaining AOP in any great detail (except as it applies to transactions). See Chapter 9, Aspect Oriented Programming with Spring for detailed coverage of the following AOP configuration and AOP in general. It is also possible to use the Spring Framework’s @Transactional support outside of a Spring container by means of an AspectJ aspect. To do so, you first annotate your classes (and optionally your classes' methods) with the @Transactional annotation, and then you link (weave) your application with the org.springframework.transaction.aspectj.AnnotationTransactionAspect defined in the spring-aspects.jar file. The aspect must also be configured with a transaction manager. You can of course use the Spring Framework’s IoC container to take care of dependency-injecting the aspect. The simplest way to configure the transaction management aspect is to use the <tx:annotation-driven/> element and specify the mode attribute to aspectj as described in Section 11.5.6, “Using @Transactional”. Because we’re focusing here on applications running outside of a Spring container, we’ll show you how to do it programmatically. Prior to continuing, you may want to read Section 11.5.6, “Using @Transactional” and Chapter 9, Aspect Oriented Programming with Spring respectively. To weave your applications with the AnnotationTransactionAspect you must either build your application with AspectJ (see the AspectJ Development Guide) or use load-time weaving. See Section 9.8.4, “Load-time weaving with AspectJ in the Spring Framework” for a discussion of load-time weaving with AspectJ. On WebSphere 6.1.0.9 and above, the recommended Spring JTA transaction manager to use is WebSphereUowTransactionManager. This special adapter leverages IBM’s UOWManager API, which is available in WebSphere Application Server 6.0.2.19 and later and 6.1.0.9 and later. With this adapter, Spring-driven transaction suspension (suspend/resume as initiated by PROPAGATION_REQUIRES_NEW) is officially supported by IBM!